Yelp ranks second at 45.2 percent, followed by TripAdvisor and Facebook. In a period spanning Q4 2017 and Q1 2018, ReviewTrackers reached out to a U.S.-based consumer panel with a 32-item survey. The survey explored how consumers today interact with online reviews of businesses across a number of categories and industries. 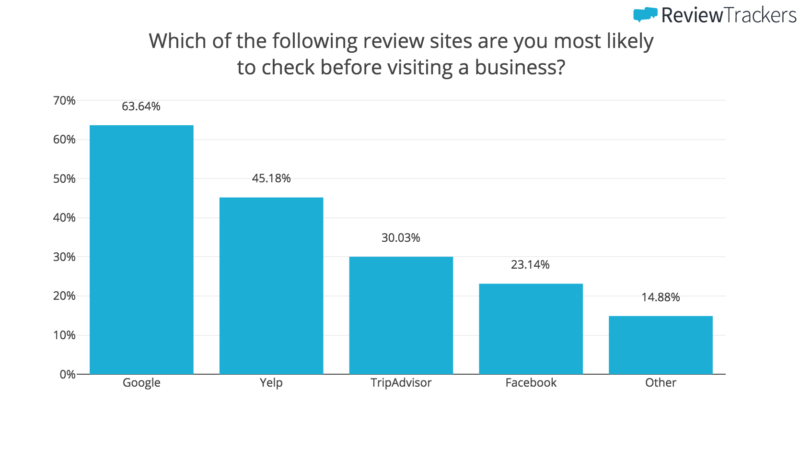 The results and findings are in line with the company’s 2017 Local Search Report, in which 21 percent of consumers agreed that reviews on Google were one of the most important factors in their search for a local business. Trends also point to an increasing number of consumers choosing Google as the place to rate and review businesses. 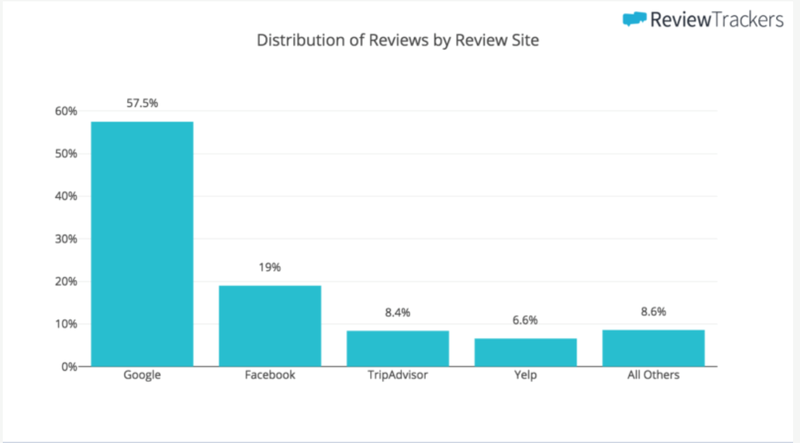 Based on the analysis by ReviewTrackers, in 2018 over half of a business location’s reviews were posted on Google or Facebook. 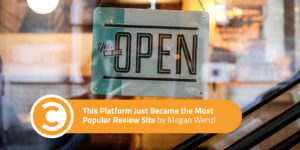 This suggests that reviews may have found a bigger home on search and social media than on review-specific platforms like Yelp and TripAdvisor. What does this mean for marketers? Well, it’s clear that reviews on Google not only impact search rankings but drive in-store traffic and conversion as well. Beyond traditional SEO tactics like keyword research and link building, marketing execs managing anything from SMBs to multi-location businesses and enterprise-level organizations must also solidify their presence on Google by proactively requesting more (and better) reviews. Another interesting takeaway from the survey is how Facebook has emerged as one of the major forces in online reviews. Last year, ReviewTrackers actually looked at online reviews of 250 restaurants over a six-month period and noticed an interesting trend in review velocity: Among major restaurant review sites—including Yelp, Google, TripAdvisor, Zomato, and Foursquare—Facebook reflected the highest growth rate in reviews. New reviews appear on Facebook four times faster than on other restaurant review sites. Reviews on Facebook also tend to stay relevant longer than do other types of user-generated social media content. According to a study by Wiselytics, 75 percent of engagement on a Facebook post occurs within the first five hours. Reach isn’t that much better. In fact, 75 percent of the people who get to see your Facebook post will have seen it in the first two hours. Compare this to the 69 percent of consumers who believe that reviews older than three months are no longer relevant. Approximately 15 percent, meanwhile, believe that the only relevant reviews are the ones written within two weeks. At any rate, the shelf life of reviews—posted on Facebook, Google, or other review sites—is considerably longer than the shelf life of Facebook posts and other branded social media content. It’s clear that reviews play a huge role in shaping consumer behavior. But even in 2018, not all businesses are able to match customer expectations with reality, particularly in terms of responding to feedback. 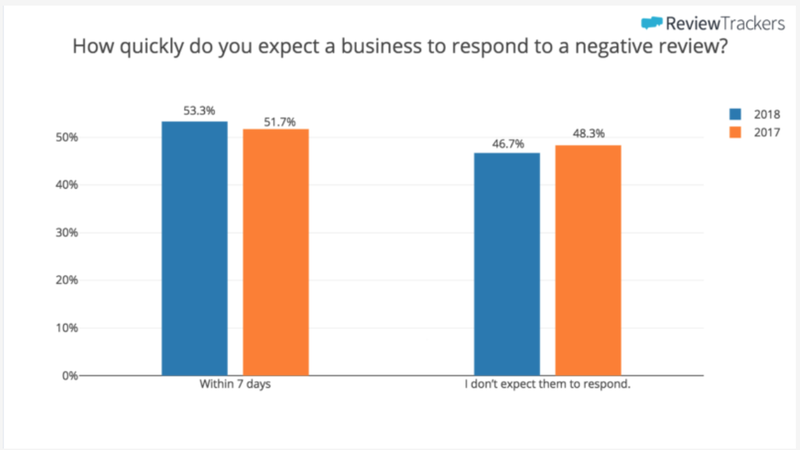 According to ReviewTrackers’ survey, approximately 53 percent of customers expect businesses to respond to their online review within a week. And yet 63 percent say that a business has never even responded to their review. Winners and losers will be determined by who manages to bridge the gap between what consumers expect and what brands provide. Indeed, responding to reviews makes a real and measurable difference—not just to the review-writing customer, but also to everyone else who reads the publicly available review. 45 percent of consumers say that they’re more likely to visit a business if it responds to negative reviews. For ideas on how to respond, we’ve got a step-by-step process for responding to both negative and positive reviews. Let the customer know how much you appreciate that they took the time to leave a review. Make sure you are managing reviews so that you respond as soon as possible. Customers need to know that you are attentive to their concerns and issues. No matter how negative the review is, react as politely and professionally as possible. Both the reviewer and other consumers will see your response and take the response into consideration when deciding whether or not to choose your business. If a consumer searches for “restaurants in Chicago,” they’ll see the restaurant’s star rating under the Google map. They’ll click on one of these restaurants and be taken to the map, where they can see even more restaurants. The consumer will then scroll down the page, click on another restaurant, and read the restaurant’s reviews posted on Google. If a consumer enjoyed the pizza pot pie at Chicago Pizza and Oven Grinder Company, for example, and goes to leave a review, the consumer is likely to write that review on Google. Google is the space between a brand and a consumer. Consumers will use reviews as part of their search when making decisions—such as deciding where to eat during a night out in Chicago. Megan Wenzl is the associate editor for ReviewTrackers. She's a writer who is committed to finding useful information to help businesses succeed.